I have Seagate hard drives. Acronis Drive Monitor found a Reallocated sector. See attachment for screenshot. After this, I decided to check the Seagate support and obtained a tool to make long generic tests to find and repair bad sectors. It is what Seagate recommends. 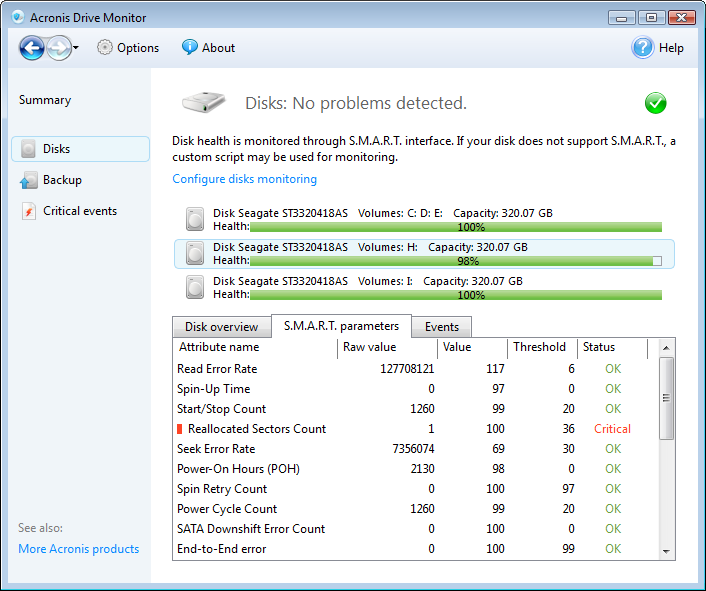 The Windows version of Seatools couldn't find any error on any drive. As Seagate recommends the DOS version of the application, I downloaded and burnt the bootable CD. My drives were checked again with the DOS version and nothing found. Tests performed: long generic tests with latest version of the tool from the manufacturer. Is it a false positive from Drive monitor? How important should I consider this error? It is my understanding that the Hard Drive took care of the problem and relocated the bad sector independent of the OS. Most HD manufacturers put aside space just for bad blocks. Once this extra space is used up, then the drive will report the problem to the OS and the OS can mark it bad at the File System level and it will ignore it. The S.M.A.R.T. drive does keep count and Acronis Drive Monitor can query how many blocks were re-mapped by the HD. When you run a tool to scan for bad sectors, the tool will not find the bad sector that the drive took care of because they were re-mapped. If the OS is having to re-map the bad sector, then your tool would find it. I would not worry. In the old days drives never re-mapped out side of the OS. You would see many bad sectors on brand new drives. The HD companies are not necessarily making better drives, they can just hide the flaws better with automatic bad sector re-mapping.